Has Nadal become Djokophobic ? Nadal had been struggling with knee related problems in the recent past; but as of today after losing out an epic of Grand Slam Final at Melbourne against Novak Djokovic must be suffering from a new symptom, he might be "Djokophobic". 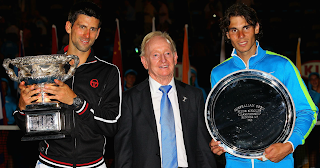 Today, after gruelling five hours and fifty three minutes of heavy weight clash between the World's best two, Djokovic was able to retain his title, and won his fifth Grand Slam Championship. This was their third successive Grand Slam final, starting from Wimbledon, and Nadal lost all of them. Most interestingly here to notice is that , this was Nadal's seventh straight loss, all coming in finals. These also included two losses on Nadal's favourite surface, clay in Rome and Madrid. Now, the overall head to head remains just 14-16, in favour of Nadal, after some amazing previous season by Djokovic. With this loss Nadal, becomes the first man to lose three straight Grand Slam finals in the Open era. Nadal is also involved in rivalry with Federer, but never he been demolished in succession as of this. Today, both of them looked physically extremely fit, but at crucial moments, Nadal was not able to capitalise. Even though in the deciding set after Nadal leading 4-2, it was all looking that he's going for his 11th Grand Slam, but Djokovic rose to the occasion and fought like a number 1, and proved his mettle and clinched victory from jaws of defeat. Now, as the season will go on the question will remain, will Nadal be able to overcome Djokophobism; its also quite natural that losing in such in and out situation for so long one tends to bring few in-built thinking which can play an important psychological barrier in the performance. But, the King of Clay, is mentally strong enough to overcome such crisis and has the ability to put past aside and raise his bar.